My boyfriend and I absolutely adore the arts - visual, performance, you name it. In fact, our very first date was a day at the Museum of Contemporary Art, San Diego. I have been meaning to go back ever since - especially with my 25th birthday just around the corner (visitors under 25 are free!). A few weekends ago, we finally jumped on it. As always, I was impressed by the exhibits on display. Outside of the downtown MCASD, there was a beautifully painted piano inviting any passerby to play. My boyfriend and I had a delightful time playing jazzy tunes (basically us pressing random keys as we made weird noises, ahem, I mean scatted) and watched a tutorial on how to play Mary had a Little Lamb, which I successfully mastered after only a hundred attempts. Once inside, I noticed that the current exhibits were themed around the senses - with sight, sound, and smell at the focus of the three exhibits in the building at 1100 Kettner. There was an amazing light exhibit entitled Light and Sound by Robert Erwin. On face value, it is just a wall with lights positioned in a cris-crossing pattern. But after looking a while longer, I became fascinated. The way the lights are positioned gives the light a sense of texture, also appealing to my sense of touch in a phantomly manner. The piece is simply fascinating, enticing the viewer to move about the room to see the piece from all angles. My favorite exhibit was Mother Body Emotional Densities, for Alive Temple Time Baby Son by Ernest Neto. The second I stepped into the room, I was engulfed by a wave of olfactory delight . Turmeric, ginger, and cloves hung heavily about the room in engorged sacks dyed by the spices’ rich colors. The effect was entrancing. I spent close to half an hour smelling, touching and enjoying the simple beauty of this exhibit. Across the street, at 1001 Kettner, Iñigo Manglano-Ovalle’s Juggernaut looped a hauntingly beautiful scene of a large vehicle driving across a salt mine in Baja California. Combined with the sounds of the salt granules crunching beneath the behemoth of a machine, it was very striking and mesmerizing. I had never before seen a film by this artist, and it was a wonderful introduction. 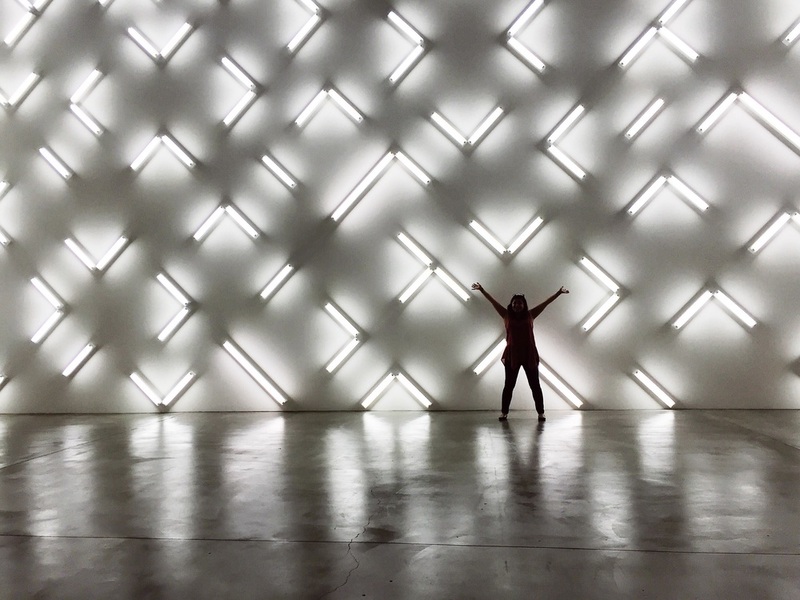 MCASD never fails to provide thought-provoking and beautiful exhibits. I am excited to see what they will have next!